[Gary Petty] Do a quick Internet search and it’s amazing how many sites and YouTube videos there are dedicated to heavenly signs in biblical prophecy. On a regular basis religious radio programs are abuzz with the subject. And books on heavenly signs in biblical prophecy can become popular overnight. Self-proclaimed prophets appear with regularity promoting the latest predictions about the blood moons, the solar eclipses, meteorite showers, movements of the constellations or the appearance of Planet X and these are all supposed to be heavenly signs predicted in the Bible. Various Scriptural passages are used to reveal that these celestial events announce the coming of the rapture, the tribulation or the return of Jesus Christ. Are solar eclipses, blood moons or mysterious Planet X fulfillments of biblical prophecies? Are they dramatic proof of predictions in the book of Revelation? On Beyond Today we’re going to take a look at some of the most famous biblical passages about “Signs in the Heavens” and what they reveal about end time prophecy. King David wrote, “The heavens declare the glory of God; and the firmament shows His handiwork” (Psalms 19:1). Like David, when we look at the wonder of the sun, moon, planets and the stars we see the awesome handiwork of God. In August 2017, I was outside my home with my special solar glasses watching the total solar eclipse. It was an eerie feeling as the sun disappeared behind the moon or watching the “shadow bands,” sometimes called “shadow snakes,” which is a light effect caused by the eclipse. An eclipse is an awe inspiring display of God’s creative genius and powers. But was that eclipse the fulfillment of biblical prophecy foretelling the time of Christ’s return? In September 2017 some heavenly sign prophets declared that these events were being fulfilled by the solar eclipse and Hurricanes Harvey and Irma which stirred up waves on the coast of the United States. Jesus answered by giving them details about the time when He will return to establish God’s kingdom on the earth. He tells them, and here is what He says, “Take heed that you be not deceived. For many will come in My name saying ‘I am He,’ and ‘The time has drawn near.’ Do not go after them. But when you hear of wars and commotions, do not be terrified; for these things must come to pass first, but the end will not come immediately” (Luke 21:8-9). Jesus actually said that one of the signs of His second coming is that there will be religious preachers proclaiming His return but they will be giving false information about His return. They will deceive people with prophetic proclamations and Jesus said not to follow them. How can we discern when a message about Christ’s return is true or not true? Well one important thing to remember—Jesus said concerning His return, “But of that day and hour no one knows, not even the angels of heaven, but My Father only” (Matthew 24:36). When dealing with prophecies about Christ’s return we must be careful to discern what is actually told to us and be willing to admit what we don’t know. We just read in Luke 21 where Jesus said to be careful to not be deceived about predictions of His return. Jesus then gives details of what to actually look for as predictions of His Second Coming as the signs. Now this list includes wars, earthquakes, famines and pestilences, persecution on the church, and Jerusalem being surrounded by armies.” (Luke 21:10-24). “And there will be signs in the sun, in the moon, and in the stars; and on the earth distress of nations, with perplexity, the sea and the waves roaring; men’s hearts failing them from fear and the expectation of those things which are coming on the earth, for the powers of heaven will be shaken. Then they will see the Son of Man coming in a cloud with power and great glory. And when these things begin to happen, look up and lift up your heads, because your redemption draws near” (Luke 21:25-28). Notice, this is very important, that the signs in the sun, moon and stars are directly related to the immediate return of Jesus Christ. It is a great time of distress of nations, the powers of heaven are shaken, and people will see the Son of Man coming in a cloud of power and great glory. Blood moons, solar eclipses, and the movements of constellations are all mathematically predictable revelations of God’s great power and handiwork. But what Jesus is talking about in the Olivet Prophecy is much more than predictable phenomenon God designed in the universe. It’s the very shaking of heavens that draws the attention of all humanity. It strikes fear into all who witness these signs. This didn’t happen in any of the so-called signs of the last few years. In Matthew’s account of the Olivet Prophecy Jesus gives a similar list of international chaos and natural disasters that will happen before His return. Now Matthew records even more details about what Jesus said about the signs in the heavens. Listen to what he wrote: “Immediately after the tribulation of those days the sun will be darkened and the moon will not give its light; the stars will fall from heaven; and the powers of the heaven will be shaken. Then the sign of the Son of Man will appear in heaven, and then all the tribes of the earth will mourn, and they will see the Son of Man coming on the clouds of heaven with power and great glory” (Matthew 24:29-30). Now notice, the signs in the heavens predicted by Jesus in the Olivet Prophecy happen AFTER the tribulation. Read it in your Bible. The heavens will be shaken. The sun and moon are darkened. These are not natural, predictable occurrences, but unique events caused by the power of God intervening in human history. To use Luke 21:25 as a prophecy concerning events happening BEFORE the tribulation is a total misunderstanding of what Jesus taught. This is why it is so important for Christians not to get caught up in the emotions of the latest signs in the heavens predictions. There is another fascinating prophecy predicting signs in the heavens. It’s in Revelation chapter 6. The apostle John was given visions of the time leading to the return of Jesus Christ. He wrote, “I looked when He opened the sixth seal, and behold, there was a great earthquake; and the sun became black as sackcloth of hair, and the moon became like blood. And the stars of heaven fell to the earth, as a fig tree drops its late figs when it is shaken by a mighty wind” (Revelation 6:11-13). John’s vision includes a great earthquake, the heavenly signs of the sun becoming black, the moon looks like blood. And he describes what appears to be an enormous meteorite shower or asteroid shower. “Then the sky recedes as a scroll when it is rolled up, and every mountain and island was moved out of its place. And the kings of the earth, the great men, the rich men, the commanders, the mighty men, every slave and every free man, hid themselves in the caves and in the rocks of the mountains, and said to the mountains and rocks, “Fall on us and hide us from the face of Him who sits on the throne and from the wrath of the Lamb!” (Revelation 6:14-17). This is the most dramatic heavenly sign in human history. The sky appears to literally open up so that all people everywhere on earth can see the return of Jesus Christ. People hide in terror as the earth shakes, islands are swallowed up in massive tsunamis, the sun and moon are covered in darkness, the skies are filled with boiling clouds. It’s so frightening that people who don’t understand what is happening, they actually wish for death. Now we just read that these heavenly signs are called the “sixth seal.” In the fifth chapter of Revelation the apostle John is given a vision of God’s throne. He sees a scroll sealed with seven seals. In the first century, a scroll would have a wax seal on it that would be broken so you could open the scroll. In John’s vision, as each of these seven seals are broken the scroll opens up a little more. As the scroll unfolds he is given visions of events that will occur at the end time. Now if the sign in the heavens are the sixth seal, it must be preceded by five other seals. To understand the time frame of the sixth seal’s heavenly signs, we must know what happens before they occur. Those who know the biblical prophecies will understand the exact meaning of these signs because they will witness and properly discern what happens before these signs appear. The first four seals, also known as the Four Horsemen of the Apocalypse, predict a religious movement that will conquer through violence. There will be great wars throughout the world, just not locally, there will be famine and disease. The trends will be devastating on a worldwide scale. Now these events aren’t just some kind of local happenings. The book of Revelation even tells us the level of devastation caused by the Four Horsemen of the Apocalypse. Here’s what John wrote, “And the power was given to them [these are the four horsemen] over a fourth of the earth, to kill with sword, with hunger, with death and by the beasts of the earth” (Revelation 6:8). These events happen before the heavenly signs of the sixth seal. And the fifth seal is persecution of Christians who refuse to submit to a political and religious power the book of Revelation calls the Beast. According to the Olivet Prophecy this, the fifth seal, is the beginning of the time known as the Great Tribulation. So let’s recap what we learn from Revelation. The first five seals must happen BEFORE the heavenly signs of the sixth seal. The first five seals involve worldwide devastation and persecution of Christians. Nowthe sixth seal of Revelation is describing the same heavenly signs predicted by Jesus in the Olivet Prophecy. And remember, He said that these signs he talked about happen AFTER the tribulation. Not before. The heavenly signs of the sixth seal and the Olivet Prophecy announce the events of Christ’s immediate return. In Revelation the sixth seal is followed by the seventh seal which involves the seven trumpet calls signifying God’s judgment on the earth. With the seventh trumpet blast Christ stands on the Mount of Olives. Now once we understand the context of the heavenly signs in Christ’s Olivet Prophecy and the sixth seal of Revelation, now we can look at other passages about heavenly signs and we can really have a better understanding about what those passages about. Now a great deal of heavenly signs speculations center on an Old Testament prophecy in the book of Joel. Here’s what he said, “And I will show wonders in heavens and in the earth: blood and fire and pillars of smoke. The sun shall be turned into darkness, and the moon into blood, before the coming of the great and awesome day of the LORD” (Joel 2:30-31). Now once again, this passage isn’t referring to natural, predictable times when the moon turns red or there’s a solar eclipse. The awesome events of this prophecy announce to all humanity the Day of the Lord. The book of Revelation describes this Day of the Lord. Let’s look at what John writes about one of the signs. He says, “I saw heaven opened, and behold, a white horse. And He who sat on him was called Faithful and True, and in righteousness He judges and makes war. His eyes were like a flame of fire, and on His head were many crowns. He had a name written that no one knew except Himself. He was clothed with a robe dipped in blood, and His name is called The Word of God. And the armies in heaven, clothed in fine linen, white and clean, followed Him on white horses. Now out of His mouth goes a sharp sword, that with it He should strike the nations. And He Himself will rule them with a rod of iron. He Himself treads the winepress of the fierceness and wrath of Almighty God. And He has on His robe and on His thigh a name written: KING OF KINGS AND LORD OF LORDS” (Revelation 19:11-16). The Word of God is Jesus Christ. He is returning to conquer all human governments and remove Satan as the god of this world. This is what the prophet Joel is inspired to write about in his prophecy. It’s exactly what Jesus taught in the Olivet Prophecy and the apostle John saw and recorded in his vision. There is a wonderful continuity in these prophecies that reveals God’s inspiration. It’s important that Christians don’t become so fascinated by the all this speculation about eclipses, and blood moons, Planet X that we are caught by surprise by the events prophesied by Jesus as signs of His coming. These events are also revealed in the first five seals of the book of Revelation and according to what it says there, twenty-five percent of the world’s population dies in the catastrophic events of the first four seals. Christians who don’t follow the Beast will suffer persecution that’s the fifth seal. If your attention is on the constellations instead of the clear signs given by Jesus and revealed in Revelation, your faith will be shaken when these events happen. Of course this doesn’t mean that God hasn’t used heavenly phenomena in His interaction in human history. I mean, some examples are the “star of Bethlehem” that led the wise men to Jesus, the terrible plague of darkness on ancient Egypt, and Joshua’s long day. But notice none of these events were humanly foreseeable. No one was able to plot their course and mathematically predict the next occurrence like an eclipse or blood moon. So what have we been able to conclude from the prophecies we’ve read today? 1. The heavens reveal the handiwork of God. 2. The heavenly signs predicted in the Olivet Prophecy and in the sixth seal of Revelation are prophecies about the immediate return of Jesus Christ and occur after the tribulation. 3. These heavenly signs aren’t predictable, natural occurring events. 4. When we become overly concerned with heavenly signs we are in danger of missing the actual signs of Christ’s return prophesied in the Scripture. We’re joined by Darris McNeely and Steve Myers and we are going to continue to discuss this issue of prophecies concerning heavenly signs. [Gary] Why is it, guys, that so many people are so fascinated, so many Christians, with the new heavenly signs predictions? [Darris McNeely] Well, Gary, it’s a means of trying to make sense in a chaotic world with an overly simplistic understanding or message and it just absolutely skews the whole situation because, and unfortunately it actually gives a field to those who want to take aim on the Bible and discredit it because it puts people back to a more primitive time where people didn’t understand the natural world and tried to interpret everything that happened by some natural phenomenon. And yet when you look at scriptures there are some specific roll out of those prophecies but when people get to looking at every eclipse, every blood moon, every alignment of whatever might be up there in the constellations, they are misreading scripture and they are discrediting the Bible and the very word of God that they profess to understand, and that’s one of the real tragedies that people don’t really focus on. [Steve] Yeah, there seems to be this sense of these things are in the Bible and if I could just figure it out and recognize these things, then I’ll have this great understanding and I’ll be ahead of the game and maybe I’m more religious when they think of it that way. But like Darris said, that’s nothing new. That’s astrology. That’s something that goes all the way back and so it’s been with us forever so it’s, you know, not surprising that it’s still here today. [Gary] Well, you know, I think too there is a danger here as people get wrapped up in this that as these prophecies fail and certain things don’t happen, they’ll start to not believe the scripture and is that not a danger that we are facing because of this? [Darris] Well it is, and they’re not really focusing upon what Christ really did say. If you look back at the Olivet prophecy the signs, actually the first four signs that Christ pointed to in response to the Apostles question, he deals with things that are really in the headlines today and in front of us: war, false religion, and unfortunately a lot of people who are sincere but these people are caught up in their own version of a false Christianity, a false religion, and those are the things are really in front of our eyes that are important to understand and getting caught up in a natural phenomenon like an eclipse, again, takes people off of the reality of what’s not only the scripture says but the reality of what’s taking place in our lives and the need to address things and so that’s really where they are. [Steve] Yeah, I think when you, you think of it that way there’s that passage where Christ said, you know, the people say “Lord, lord” you know, and He says, “I never knew you.” And so there is something a whole lot more important than these astrological things that are going on that gets deeper into what’s really spiritual. What is righteousness all about, what is true spirituality? And if we get so involved in these physical things we’re going to be off track and we’ll miss the most important aspect of what God wants for us. [Gary] Well like you were just saying, when you look at what Jesus says are the signs, yes there are heavenly signs but they’re after a whole lot of other events take place and those other events aren’t Hurricane Harvey. They are massive scale, all over the world hurricanes and earthquakes. [Darris] There will be no question when those heavenly signs of Revelation begin to occur. There will be no question that we have entered into a period unlike any in human history or in human experience. The natural phenomenon that will be there is going to uh be off the scale. [Steve] You’re not going to miss it, you’re not going to miss it. [Gary] Right, right. Well, which really brings us to what Jesus said here which is to watch, and be ready. How do Christians, how should we spend our time, watching and getting ready? [Darris]: Well, let’s go back to scripture in Luke chapter 12 where Christ had a group of skeptical Jews in front of Him who did not understand who He was, the son of God standing in the flesh, God in the flesh before them, and Jesus said look, you can look at the sky and determine whether it’s going to rain or what weather pattern is coming in. But you cannot discern this time, your time. And He was really making a point, not only for them, but also for disciples of all ages that understand your times, understand prophecy in the balance way connected with the history of the world and see God’s plan unfolding among the nations, and then let that be, let that move you to a, to a standard of righteousness to good works to clean up our own life to be prepared before these events come and catch us unawares. That’s what he meant by “watch you” and it’s not necessarily, again, getting involved in the idea of a year of the age or whatever that some guru has cooked up and written about that talks about blood moons or constellations aligning without uh really focusing on righteous living according to the standard of the scripture. [Steve] Yes, it’s interesting that there is that connection between watching and being ready. We can watch all these happen, and so you recognize it. But if you’re not spiritually prepared then it does no good whatsoever so you’ll miss the boat, in that sense. And so you’ve got to be spiritually prepared. You know, Peter said the fact that, you know, we know these things are going to happen, what manner of people are we going to be? What are we going to be like, what is our life? Do we develop a relationship with God? That becomes most critical. Be spiritually ready. [Gary] We can discern when there is going to be a next eclipse, you know there’s one coming in a number of years. It’s going to come across the United States again. We can discern that, and he said – he told them – you’re not discerning the real issues. I think that message is still for us today, isn’t it? You may be discerning these physical things but you’re not discerning the real issues. [Darris] And people are by letting it bypass their lives when they get caught up in all of these matters and frankly the moral, cultural, righteous issues that are ripping the fabric of societies, America and other nations, apart right now are the issues that really do concern people in their everyday lives and getting to an understanding of how to address those and begin to take steps to uh de clutter your life and move that chaos out of your life is really what Christ is talking about and don’t worry about those heavenly signs. Worry about your own life and that sign of righteousness in your own life. [Steve] In fact, if you keep reading after those signs in Matthew 24, keep reading. It’ll talk about how you should be spiritually ready. Parable after parable Christ tells all of these stories that says be spiritually ready. [Gary] Like Matthew 24, Matthew 25. That’s all part of the Olivet Prophecy. [Gary] And people forget, and they separate Matthew 25. [Darris] Matthew 25 tells you how to live while you are waiting for the events of Matthew 24 to take place. Throughout today’s program we looked at several famous biblical passages about “Signs in the Heavens” and what they reveal about end time prophecy. To help you understand much more about this subject and other matters related to Biblical prophecy—we have prepared a valuable, free study aid titled: The Book of Revelation Unveiled. 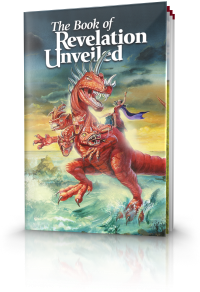 I encourage you to order your own free copy of The Book of Revelation Unveiled by calling us toll-free, 1-triple-eight-886-8632. That’s 1-triple-eight-886-8632. Or you can go online at beyondtoday.tv or write to us at the address shown on your screen [Beyond Today, PO Box 541027, Cincinnati, OH 45254]. And, when you order your free study aid we’ll also send you a free subscription to Beyond Today magazine. Each bi-monthly issue of Beyond Today is filled with well-researched articles designed to assist you in better understanding many remarkable and exciting biblical truths. Again, to order your free study aid The Book of Revelation Unveiled and your free subscription to Beyond Today magazine call 1-triple eight-886-8632. Or go online to beyondtoday.tv to read or download them. Now in addition, when you visit beyondtoday.tv, we welcome you to watch BT Daily . These short daily videos cover a range of Bible topics and current events. Plus, you can watch BT Daily and our 30-minute Beyond Today programs anytime on YouTube, Apple TV, Amazon Fire TV, Roku and other streaming-enabled devices. In March 1997 people were shocked by the largest mass suicide in U.S. history. Thirty-nine members of the religious cult “Heaven’s Gate” were found in a beautiful California mansion each dressed in black pants, black shirt and new athletic shoes. Brought together by a religious smorgasbord of Christianity, New Age, paganism and science fiction and spurred by a belief that the Hale-Bopp comet was an apocalyptic sign, these people killed themselves in order to travel to a better place of existence. Jesus said to watch and be ready. Being right with God, submitting to His direction, putting Him first in your life, being a disciple of Jesus Christ: this is what is important for Christians. Join us next week on Beyond Today as we continue to discover the gospel of the kingdom. We also invite you to join us in praying, “Thy kingdom come.” For Beyond Today, I’m Gary Petty. Thanks for watching. [Announcer] For the free literature offered on today’s program go online to beyondtoday.tv.